This Situation Update describes events occurring in Mone [Moo] Township, Nyaunglebin District during the period between February and August 2016, including civilians’ livelihood, health, education, logging, support for civilians, and Tatmadaw activity. In 2015 and 2016, there were increases in the use and trade of ‘yaba’ in Maw Hko village tract, Mone Township, Nyaunglebin District, even though area leaders prohibited it. Between February and August 2016, civilians in Mone Township, Nyaunglebin District received support from non-governmental organisations (NGOs), the Burma/Myanmar government and Karen National Union (KNU). Between February and August 2016, Karen National Liberation Army (KNLA) as well as civilians conducted logging in Maw Hko village tract, and the Tatmadaw collected taxes for this. 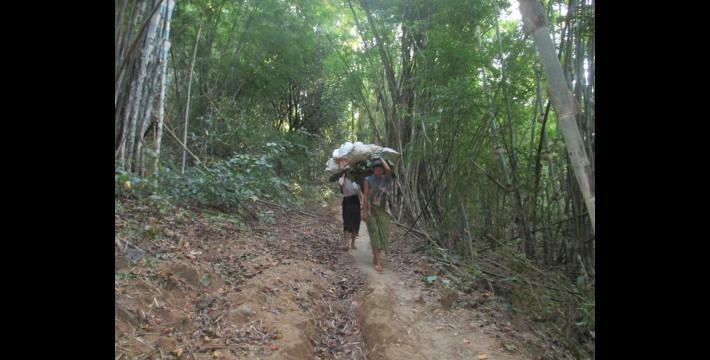 The Tatmadaw based nearer A--- village and B--- village, Maw Hkoh village tract rotated their troops very often but the villagers are not sure about the reason for their activities. The following Situation Update was received by KHRG in August 2016. It was written by a community member in Nyaunglebin District who has been trained by KHRG to monitor human rights conditions. It is presented below translated exactly as originally written, save for minor edits for clarity and security. This report was received along with other information from Nyaunglebin District, including 13 photographs. In terms of livelihoods, civilians [in Mone/Moo Township] mainly work on hill farms, betel nut plantations, betel nut leaf plantations, durian plantations and dog fruit plantations. In the villages, [villagers] also buy, sell and carry food between villages, such as rice, salt, fish paste, snacks and many oter types of food. Betel nut plantations, durian plantations, dog fruit plantations and betel nut leaf plantations are far from the villages so villagers have to go to their plantations on foot for between one and a half hours and two hours. 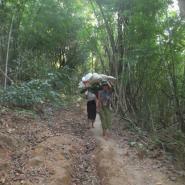 Villagers carry [supplies] in baskets when they walk there. There is also a hospital in Maw Keh Tha Per Khoh village, Maw Khoh village tract, Moo Township that was constructed by the Burma/Myanmar government and an NGO [non-governmental organisation], and the Burma/Myanmar government provides one health worker for the hospital. This nurse is given free accommodation beside the hospital, which was constructed by villagers. She also has one female colleague to help her providing healthcare services. Adult and elderly villagers face common illnesses, such as high blood pressure, low blood pressure, gastric illness and TB. There has been a lot of rain so many children have been ill with fever and malaria. 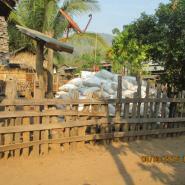 There is also a volunteer health programme run by an NGO and the Burma/Myanmar government. Before 2010, there was a primary school [up to Standard in Maw Keh Tha Per Khoh village. 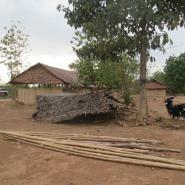 Since 2010, one [more] school [building] for a nursery school was constructed by the Burma/Myanmar government. Since 2015, the school runs [from Standard 5] to Standard 8. Construction of this new school building began in March 2014 and it opened in 2015. 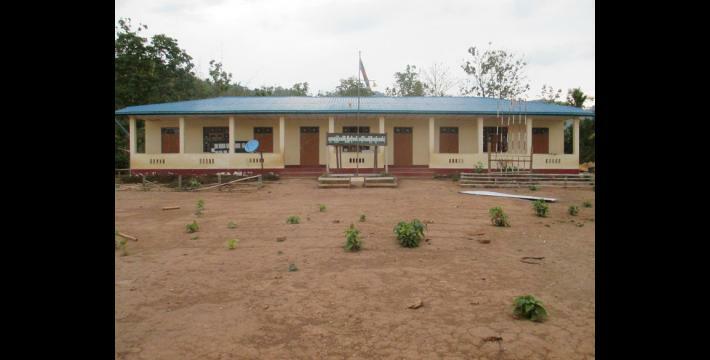 There are three classrooms in this new school building; they are a nursery classroom, a Standard 1 classroom and another room which is a temporary school office because there is no [school] office building yet. 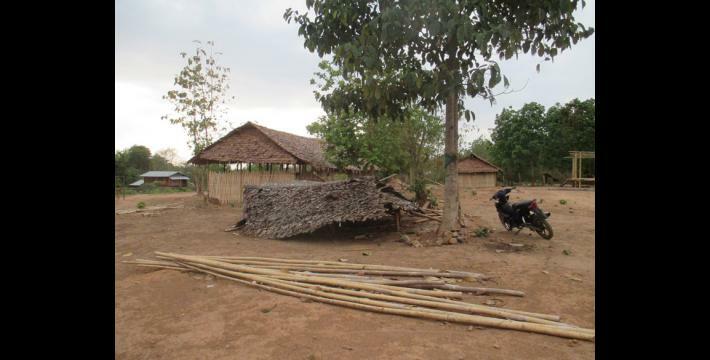 There are two other temporary bamboo school buildings for the other standards for each year [because they have to repair these buildings every year]. Standards 2, 3, 4 and 5 are taught in the first bamboo school building and Standards 6, 7 and 8 classrooms are taught in the second one. There are four male teachers from the Burma/Myanmar government, and sixteen female teachers. Nine female teachers are from the village [where the school is] but the other eleven teachers are from other villages. 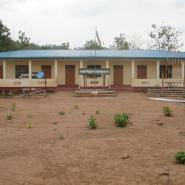 The teachers’ accommodation building is constructed inside the school campus. There are eighteen teachers who get a salary from the Burma/Myanmar government but ten teachers are village teachers [funded by the villagers]. Villagers also pay the salary for the other two nursery teachers. This school gives the students an opportunity to study Karen language and culture so one [Karen subject] teacher was chosen from the village. This Karen subject teacher gets a salary from Myanmar/Burma government as well. The [students] study Karen language and culture from 08:30 AM to 09:00 AM in the morning before school starts and then from 14:30 PM to 15:15 PM in the afternoon [each day]. They [students] are given an opportunity to study Karen languageand culture in the morning and in the afternoon every day of the week. Between 2015 and May 2016, [ethnic] Bamar people asked permission to do logging from KNLA Battalion #8 led by Bo S’Tee, which patrols in Maw Hkoh village tract, Brigade 3 [Nyaunglebin District]. 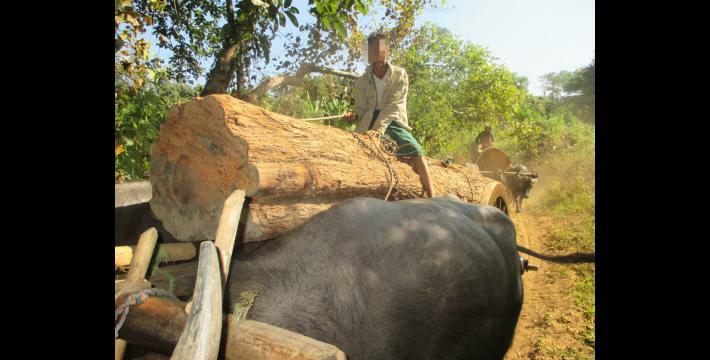 They reached an understanding with [KNLA] company staff and paid a week tax [to allow logging for one week] or ten days tax [to allow logging for ten days] to the [KNLA] company staff and they also had to pay a tax for each log carrying cart. The KNLA staff gave permission to Bamar people so they could conduct logging together with [KNLA)] company staff and villagers. 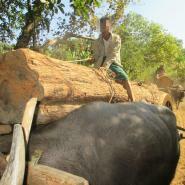 The village tract has a rule against logging or burning logs for charcoal but lots of the [KNLA] company staff conduct logging. Tatmadaw [camps] are based on the hill of A--- [village] and B--- village, Maw Hkoh village tract and they are located on the villagers’ land. Some Tatmadaw soldiers are rotated once every four months but some Tatmadaw soldiers are rotated once every two or three weeks. We do not know why they rotate like this. The Tatmadaw who are based in B--- village [army camp] set up their army to patrol [other places]. When [KNLA] gave permission to the Bamar people to conduct logging, they [Tatmadaw] patrolled at Hsaw Wah Der [village], B--- Bridge and built their checkpoint there. All carts [drivers] had to pay five thousand kyat [US $3.83] for each cart when they passed this checkpoint. Villagers had to drive the Tatmadaw soldiers on their carts when they were rotating [to other places] or if anything happened and they had to go somewhere, they asked to borrow villagers’ motorcycles or villagers had to drive them [to wherever they wanted to go]. [to villagers] and [villagers had to pay] the interest of 1.5%. KNU Animal Husbandry Department distributed animals; fifty pigs and fifty goats [across the township]. These fifty pigs were bred by the Cooperated Husbandry System; villagers breed a pig for one year and then they have to give one piglet back. KNU Husbandry Department distributed fifty pigs to fifty families to breed and they do not give each family more than one pig to breed. Regarding goat husbandry, they were bred together in the places far away from the villages. The trade and use of yaba against the law of the [Burma/Myanmar] country and it was forbidden by area leaders in village tract. Between 2015 and 2016, because the number of [people] using yaba has increased, lots of people are worried about the young people. Bo is a Burmese title meaning ‘officer. All conversion estimates for the kyat in this report are based on the November 14th 2016 official market rate of 1,301.42 kyat to US $1. The Nippon Foundation is a Japanese NGO currently implementing social innovation and development projects in Burma/Myanmar. 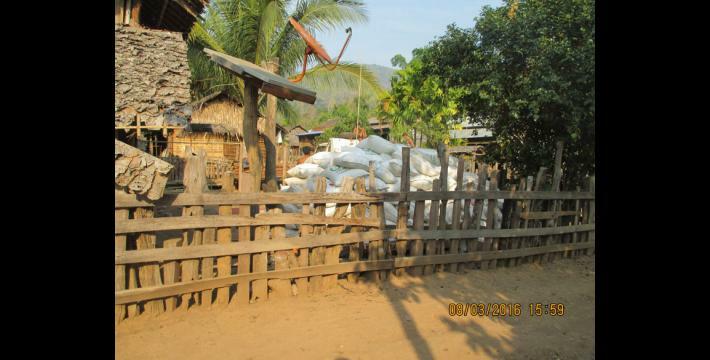 KHRG has received several reports from community members on The Nippon Foundation’s recent activities in Thaton and Hpa-an Districts, see more at “Hpa-an Situation Update: Hlaingbwe and Nabu townships, December 2014 to January 2015,” KHRG, July 2015; and “Thaton Situation Update Bilin and Hpa-an townships, June to November 2014,” KHRG, February 2015. Mya Sein Yaung Project was initiated in 2014-2015 fiscal year by U Ohn Myit, just ahead of the 2015 elections. The project aims to reduce poverty in the country by 16 percent, by giving loans to the villagers and charging low interest on a yearly basis. The projects were planned to allocate 30 million kyat for each village; the amount is considered as capital for the village and the yearly interest will be added to the funds. However, according to KHRG reports received from community members in some Karen Districts, participating in the project is difficult for poor villagers who have no money. Village representatives, chosen by the project workers, prioritised their relatives when deciding to whom they would give money. Villagers there must pawn belongings in order receive a loan. See: http://khrg.org/2014/12/14-40-s1/toungoo-situation-update-thandaunggyi-township-april-june-2014 and http://khrg.org/2014/11/14-50-s1/hpapun-situation-update-bu-tho-township-february-june-2014. The funding for the project comes from the national budget. See "Union Minister U Ohn Myint Needs to answer", May 11th, 2015. Yaba, which means ‘crazy medicine’ in Thai, is a tablet form of methamphetamine. First developed in East Asia during the Second World War to enhance soldiers' performance, methamphetamine has become increasingly popular in Thailand, Laos, Cambodia, Vietnam, and Burma/Myanmar where it is typically manufactured. See, Yaba, the 'crazy medicine' of East Asia, UNODC, May 2008; “Woman raped and killed in Pa’an District, October 2012,” KHRG, December 2012; and Chapter IV in Truce or Transition? Trends in human rights abuse and local response in Southeast Myanmar since the 2012 ceasefire, KHRG, June 2014.